There's a cool trend in "food land" of adding flavors, fruits and toppings to S'mores. So, I gave it a try with Nutella and Coconut. It was a giant success, but a very sloppy, gooey success. Inspired by a photo of marshmallow squares by Joy The Baker, the ease of cutting and serving my Nutella Coconut S'more Bars was born - and gone in a few minutes. These pictures are of my third pan of these wonder-bars. My son's friends (who are my unofficial taste-testers) assumed I wanted them to taste-test the whole 16 bars, I guess. Then, I took a platter of them to a catered brunch (cutting them into mini-bites) and was lucky to retrieve my platter in one piece. I think someone even took the pretty paper liner just to eat the crumbs. Now, that is a compliment, right? These are so simple to make, the crust is just pressed in and the oven is not used very long. I kept them in an air-tight container with parchment between layers for a few days and they were still so delicious. Don't keep them in the refrigerator because the marshmallow will weep (they are so emotional, haha) with droplets from getting too moist. It has been a pleasure to create something Nutella-icious for BellaNutella. I hope you'll let me know if you make these, eat these and share these. I'd be lying if I said I wasn't eating one right now, too. 1) In a bowl, Whisk together the Graham Cracker Crumbs,Flour and salt. 2) In another bowl, whisk the butter, sugar and vanilla together. Then whisk in the egg. 3) Add the dry mixture to the wet mixture and stir to blend. 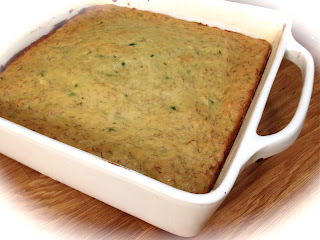 4) Turn out into a buttered 8x8 inch baking dish that has been lined with parchment and up the sides. Using your fingers, press into an even crust on the bottom of the dish. *tip- use a cupcake wrapper for easy even pressing. 5) Bake in a preheated 350F oven on the middle rack for about 10-12 minutes. Remove and allow to cool for just a few minutes. 6) Drop dollops of the Nutella on the warm crust and gently spread as the Nutella gets soft. Be careful to not tear the crust. Be patient and allow the Nutella to soften just a little. 7) Sprinkle half of the Coconut on top of the Nutella layer. Then cover with small marshmallows. 8) Bake at 350F for about 5 minutes until the marshmallows are soft. Remove from the oven and tap the marshmallows with a large spoon, just enough to form a nice delicious gooey covering. *TIP - wet your knife now and then between slicing to help make even cuts without the marshmallow sticking to the blade. Store in an air-tight container for a couple days. Don't put in the refrigerator because the moisture will make the marshmallows goopy. Yeah, I said goopy. :D Enjoy! As if Avocados didn't have enough incredible things about them, they can also replace the fat in some of our favorite baked goods. Recently, I was invited to visit an Avocado Grove, enjoy some inventive brunch items using Avocados and even experience picking my own early green Hass right off the tree. Jan DeLyser of the California Avocado Commission was our tour guide and the Farm we visited was Dan and Sue Pinkerton's. After touring the farm, we visited Mission Packing Plant in Oxnard. 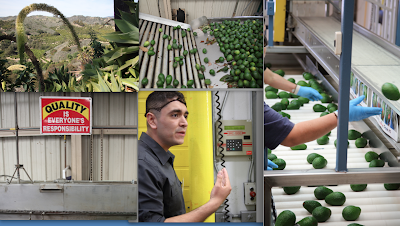 There the Avocados (900lbs per bin) are cooled, washed, sorted, labeled, temperature ripened and sent out to the stores and distribution centers. At any point in any day, I am more than happy to eat a California Avocado straight out of the shell with a sprinkle of salt and pepper. 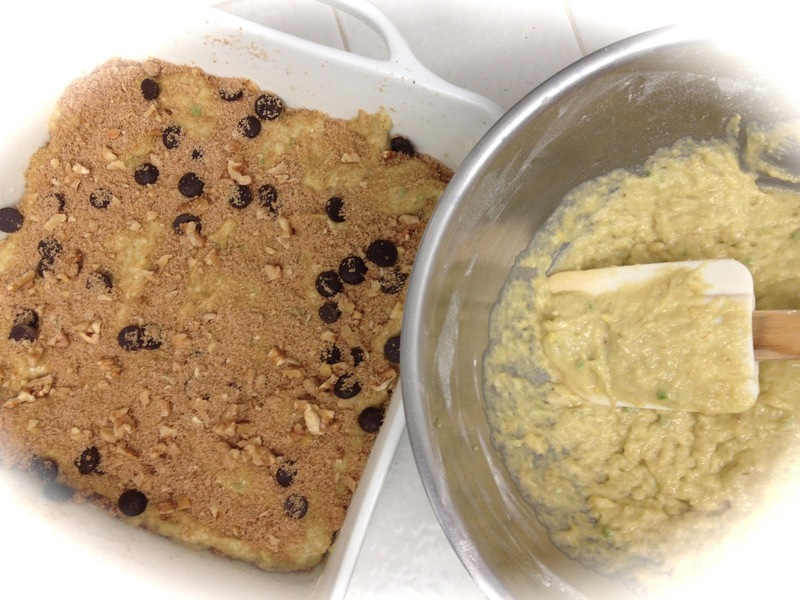 Being inspired by the tour and the education, I wanted to develop a recipe that used California Avocados in baked goods. 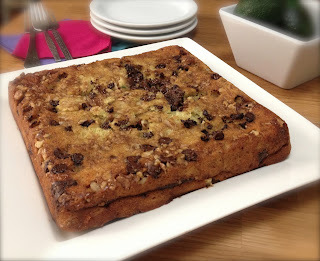 This Avocado Banana Choco-Chip Coffee cake became the recipe that was made 2 times in one week. After my teen son and friends devoured the one I left out to cool, I made another one for my post. Since then, I've made a couple more and found they freeze well, too. That makes a rushed morning even easier; I just pull out a slice and heat in the toaster oven. Enjoy and look for California Avocados when you shop. 1) Combine nuts, sugar and cinnamon in a small bowl and hold for later. 2) Cream together the Avocado, Honey, Egg, Banana, Vanilla and Yogurt. 3) In another bowl, whisk together all dry ingredients (Flour, Baking Powder and Soda, salt), then stir this into the creamed ingredients until blended well. 4) Oil and dust with flour an 8x8 inch baking pan. Sprinkle half of the nut mixture into the bottom of the prepared pan, then spoon half of the batter on top of that. 5) Sprinkle the remainder of the nut mixture over the batter and then spoon the remainder of the batter over that. 6) Bake in a preheated 350F oven 40-45 minutes or until cake tests done. Cool in the pan for a few minutes. This can be served in the pan, or inverted onto a plate for cutting, serving or freezing.